LED Signage Modules for lluminated stand offs, built up characters and back-light light boxes. 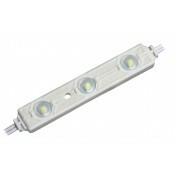 12V LED Signage Modules [SINGLE] - 0.24W per module - Cool White 6500-7000K. A modern energy efficie..
12V LED Signage Modules [DOUBLE] - 0.72W per module - Cool White 6500-7000K. A modern energy efficie..
12V LED Signage Modules [TRIPLE] - 0.72W per module - Cool White 6500-7000K. A modern energy efficie..